The leading authority on Aspen and The Good Life, ASPEN Magazine is an inspired representation of the matchless lifestyle for which Aspen is known and loved. Fusing culture, fashion, cuisine, health, local personalities, travel, luxury, sports, and nature, we are our readers' passport to authentic Aspen. With our history of award-winning editorial, the ASPEN brand has established an enviable roster of loyal local and national readers and advertisers. ASPEN Magazine is the only local publication with paid analyzable circulation, reaching 100,000 total readers per publication. 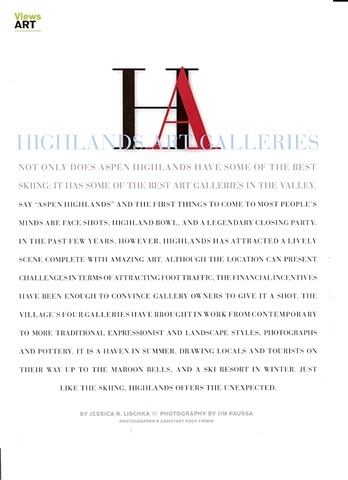 ASPEN Magazine has long been an arbiter of taste, style, and having a good time. Synonymous with integrity, distinction, and excellence, ASPEN Magazine is the go to for the worldly, the educated, the cultured-those looking for the REAL Aspen.